Bluedio T4 Continuation of the Turbine series style, the 4th generation of Turbine mainly targets the bass. Adopting all titanized 57mm diaphragm to strengthen the bass, together with ANC active noise cancelling, users to enjoy wonderful music. What's more, it uses TYPE-C three in one interface which is easy to control and supports rapid charging when headphone is in low battery condition. Rotational structure design and CD pattern mirror treatment, it's really a pair of fashion accessories. T4's Active Noise Cancelling technology cuts off surround noise significantly and lets you enjoy your music in its pure form. The ANC technology works in tandem with the 57mm drivers, so you can enjoy the immersive experience of listening a top notch music sound stage. 【ANC Technology】T4's Active Noise Cancelling technology cuts off surround noise significantly and lets you enjoy your music in its pure form. The ANC technology works in tandem with the 57mm drivers, so you can enjoy the immersive experience of listening a top notch music sound stage. You can always count on T4 headphones for crisp,vivid highs. 【Vibrant Bass/Treble and crispy Mids】T4's unique Cavity Design minimizes interference from other frequencies around you, enhances the bass response. The ear cup design includes specially designed vents, which not only adjust airflow and ventilation, but also contribute to a full-bodied, vibrant and bouncy bass. 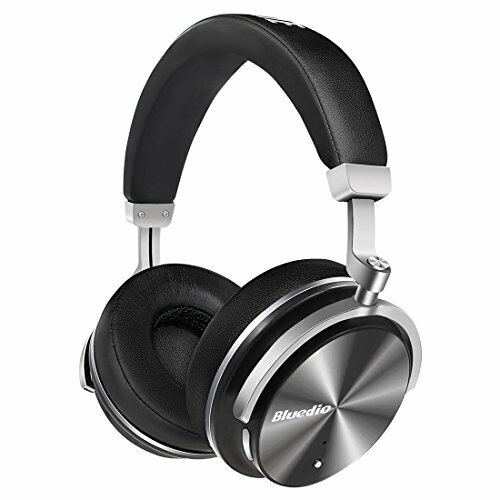 【Durability】In accordance with Bluedio's no-compromise on quality approach, the headphone is built with premium materials and high quality Polymers with chrome finish. All hinges, frames and sliders reflect high quality build. T4 is a durable headphone that will last for years. 【TYPE-C Three in One Interface】Turbine 4th generation uses TYPE-C three in one interface which supports charging and data transmitting. It can be plugged in both sides, so it's very easy to use. 【Rotating cup Design and Flat folding mechanism】To protect your ears, T4 comes with over-ear muffs and a rotating ear cup design for better fit. These headphones can be folded flat so they can accompany you on flights and long journeys without the worry of breaking.